Come aboard and enjoy the fishing trip of your dreams. 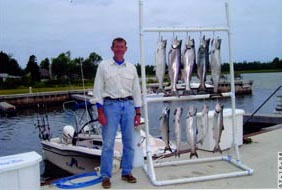 Travel Lake Michigan from Cana Island to Deaths Door with Captain Jeff Steffen who has fished these waters for 25 years. Target Salmon, Steelhead and Brown Trout. Trips daily from the Gordon Lodge Marina. Or Capt. Jeff can meet you at the Fish Creek Dock for a day of Bass or Walleye Fishing. Plan a scenic lighthouse cruise along the wondrous bluffs or a romantic sunset run to Chambers Island. Fish Tales Charters-personal, fun and memorable.